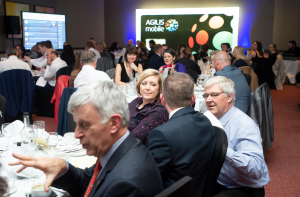 AGILIS Mobile is proud to be associated with the Ashford Business Awards as their platinum sponsor. The Ashford Business Awards celebrates the success of local businesses from Ashford and the surrounding areas across several award categories. Tina George, our Customer Service Director had the privilege to judge and present the awards in the Creative Digital and Start Up categories. In an unprecedented move this year Tina nominated two companies Hypo Hounds and DC Breathe to be joint winners of the Start-Up award as both companies were doing such great things in the local community. Hypo Hounds is an owner-based Diabetic Alert Assistance Dog Programme that trains pet dogs to alert parents when their children were showing signs of high blood sugar levels and DC Breathe who provide Emotional Wellbeing, Mental Wellbeing and Resilience training for all ages. Both start-up companies had such a passion for their businesses and the positive impact they could have on the community, it was clear they both had to receive this esteemed award. 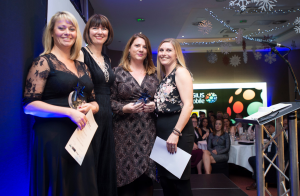 Realia Marketing, the recipient of the Creative Digital award is a full-service Marketing Agency based in Kent, their holistic approach to Digital Marketing and the outstanding work in the Snow Dog project made them worthy winners. We are committed to supporting local businesses and being involved in these awards reinforces that commitment. Receiving recognised awards like this are an excellent way of boosting your company’s credibility, sparking your employee’s motivation and furthering customer relationships.